Rachel Leng participated in DukeEngage in 2012, where she taught at the Dandelion Middle School, a non-profit school for migrant children who have moved from rural areas throughout China to Beijing. She also worked on a project to draft a bilingual report of the school’s social history by interviewing school staff, students, and volunteers and researching Beijing’s migrant policies and community. Upon returning to Duke, Rachel designed and co-taught a seminar class, ‘Social Inequality in China: Education, Minorities, and the Achievement Gap,’ to the next cohort of DukeEngage-Beijing participants. She is currently on the Investment Management team at Whiz Partners, Inc. in Tokyo, Japan, and previously worked as policy analyst and research associate at the Asan Institute for Policy Studies in Seoul, South Korea. Although I was born in Singapore and am a Singapore citizen, I grew up in Shanghai, China, from the age of 6. It was a privilege to be able to study public policy studies at Duke, and for my public policy internship requirement I wanted to apply the new knowledge and skills I learned to contribute to a project back in China – the country where I had spent most of my childhood years. The DukeEngage program in Beijing provided me the perfect means to do so. After graduating from Duke University in 2013, I pursued an MA in Regional Studies–East Asia at Harvard University. I then worked in Seoul, South Korea, at a local policy studies think tank for over a year and now live in Tokyo, Japan and work as a private equity associate for a Japanese firm, investing in healthcare and AI companies. Yes, I would say that DukeEngage significantly influenced both my academic and professional career paths. 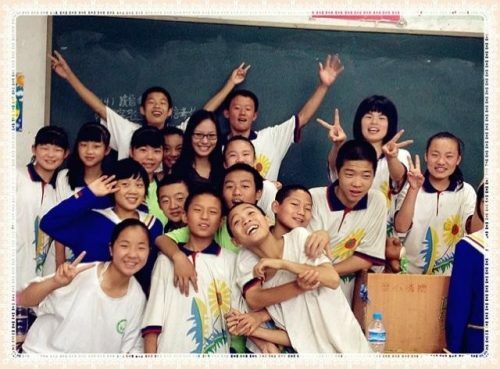 Not only did a summer at the school for migrant children in rural China instill in me a strong belief in contributing to minority communities, it also made me realize the impact of working with students to influence and expand their worldview. This is particularly important to change their perspective of themselves and what they can achieve, giving them greater confidence. Without access to such information and opportunities, it would be difficult for anybody to achieve their full potential. After my experience at DukeEngage, I co-taught a seminar for the next cohort of DukeEngage fellows and maintained a strong interest in researching and writing on minority communities to raise awareness of the challenges they face. This work led to my nomination by Yale University’s publication China Hands for their inaugural list of “25-Under-25 Leaders in China-US Relations.” The theme of striving to connect different communities via cross-cultural communication and bridge gaps in information access has continued throughout my career after graduation as well. Related to this consistent effort, I was recently interviewed by the Singapore government’s official media for the overseas Singaporean community, OSU, regarding my work and contributions to local communities across East Asia. The most meaningful part of my DukeEngage experience was probably just working with the migrant kids. They come from a background where they are ineligible to enroll in the public education system as they are not recognized as legal residents in the area they reside. Their parents have mostly migrated from rural villages to the main cities in China to seek jobs in fields such as construction or domestic work. Although from what we may consider a disadvantaged family background, these students nonetheless have valuable skills and insights often beyond their years. Being around them really taught me not to judge students based on their background according to any standard benchmark, and that basic infrastructure providing access to information and educational opportunities could significantly widen horizons and be life-changing. It was a great accomplishment for the program to have a student from the migrant school gain admittance to Duke University later on as well. Another meaningful aspect of my DukeEngage experience was having the opportunity to co-teach a class based on what I had learned to the next cohort of DukeEngage-Beijing participants. This was a way to pay it forward by preparing the next cohort to be even more effective and knowledgeable during their time at the school for migrant children in China, providing a great sense of achievement and well roundedness. It was also a dynamic learning experience to work closely with a faculty advisor to establish a productive seminar. That no matter where you are in the world, it is possible to do your part to contribute to others and learn from everybody around you. The greatest learning comes from cross-cultural understandings and being exposed to distinct environments and diverse peoples. Yes, I believe it is a very meaningful program. Whenever I conduct Duke alumni interviews with potential students, I always try to speak about DukeEngage in some way to encourage them to get involved if they have the chance. The program provides the opportunity to be immersed in a completely different community and challenges you to think about how to address global problems in new ways. That it will be a summer program you will not forget! Every Duke student should try and get involved in a DukeEngage program.